David Moore, the principal protagonist of the novel, lives on Coquina Island in the Carribbean Sea, where he owns a small hotel on the largely undeveloped island. He is a scuba diver as well, and, as the book opens, he is diving alone on the edge of a shelf, in an area known as the Abyss. He is curious and a bit acquisitive, having once discovered a brass compass in the deeps. This time, though, he discovers much more: a U-boat surfaces when he inadvertently sets off an unexploded depth charge. The boat seems to be a virtually unprecedented historical find, and a significant salvage discovery. Once the boat has been settled fairly securely in the island’s harbor, Moore returns with the island’s police constable, Kip, to explore the submarine’s interior. It’s a terrible experience for them, for the remains of the crew are still there, mummified. Worse, there is an atmosphere of evil in that submarine, a threatening, dark presence that almost seems as if the crew is still alive. They leave the boat in a rush when they see movement they can’t quite explain that they ultimately decide was caused by bad air leading to a sort of hallucination. But the boat leaves them both uneasy. And with good reason. The submariners appear to be Nazi villains and zombies all rolled up into figures of horror that the islanders have never seen and can barely comprehend. The local voodoo practitioner; the Carib Indians that dwell on the island; and Moore and Kip, fighting their logical, educated selves every step of the way, must work together to rid their home of this threat — and not just their home, for who knows what havoc a German U-boat could have on the local shipping lanes if they returned to battle, still living in a war the rest of the world left behind long ago? There are some problems with this novel. For instance, the viewpoint character shifts without warning from paragraph to paragraph. McCammon also occasionally relies on pure gore to make his point, when he is actually much better at frightening his reader through suggestion and oblique references to horrors that are far more terrifying when not gazed upon directly, but only hinted at. 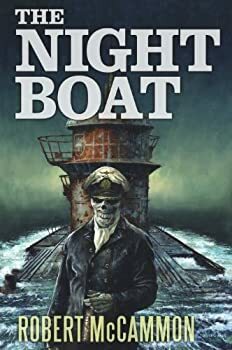 But despite these problems, The Night Boat is a fine piece of horror fiction in more ways than are immediately obvious, for the terrors visited upon the submariners are just as real, and just as well-portrayed, as are the terrors the submariners visit upon the islanders. The reader’s imagination cannot dwell comfortably for long on the idea that these men were somehow alive down there under tons of water and sediment for decades, any more than it can long think on the terrors the submariners visited upon others. It is easy to see how McCammon so quickly became established as one of the finer horror writers working in the 1980s.